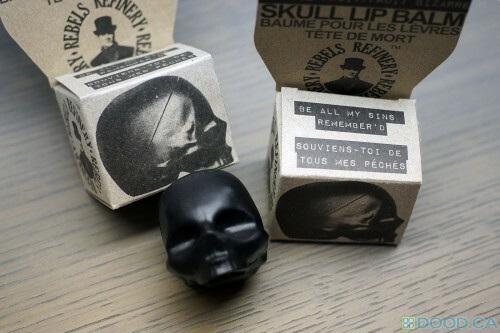 Once I saw this stuff I had to have it.. Its like EOS lip balm for men (They actually have a pink skull for women in two flavours too though). I’ve always liked the form factor of EOS with the larger ball of slightly firm yet still easily applicable balm.. which is loaded with tons of scent and tingle, in the case of the peppermint. It comes in a simple recycled cardboard packaging, and has a vintage vibe to it. The top of the skull requires just a 180 degree turn, and the cap comes off, clicking in place so that it is perfectly straight every time you close it. Overall this is a superb product, though kind of pricey. I guess some of the cost is in the gimmicky skull container, since even EOS doesn’t cost this much. However, they make a solid product, made with natural ingredients only, and it certainly performs. Highly recommended! Lets get this out of the way first: This is the current, non-tallow version of the Art of Shaving’s Lemon Shaving Cream. This is a slightly older one from around when they just removed the tallow, though I do not believe it has changed since then. I’ve tried the tallow versions of their cream, but have not tried the lemon version so can’t compare that one directly. After so many years though, its not likely too many of the tallow creams are still floating around. 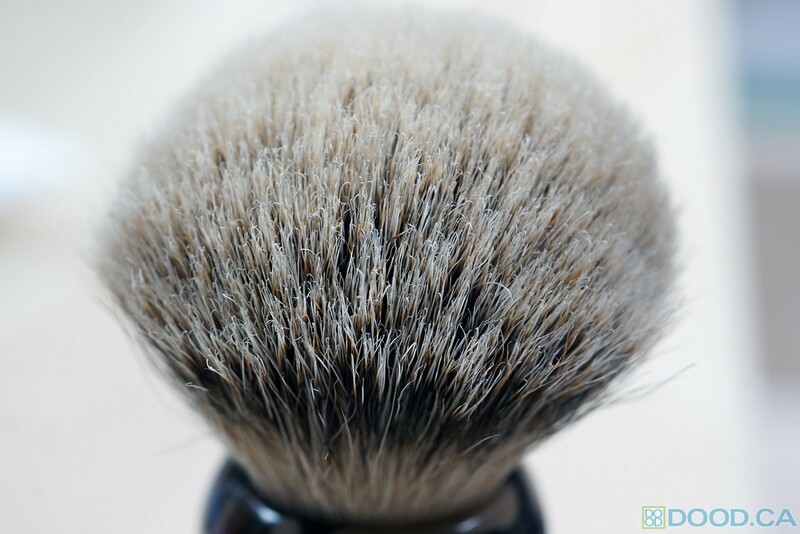 Here it is, and I’m going to lather it up with my TGN Finest 2-Band brush, mounted in a beautiful Joris two-tone stainless Steel and gold-plated brass shaving brush handle, along with my trusty old Edwin Jagger razor. This stuff tends towards the more expensive, though is still pretty reasonable when it comes to a “luxury” good. A tube will last many months, and for the quality of the product is priced very fairly. The cream has a wonderful lemon scent to it, leaning towards the dry side. Its not a sweet lemon drop type of scent, but might hint towards a lemon loaf or lemon meringue pie type of smell. 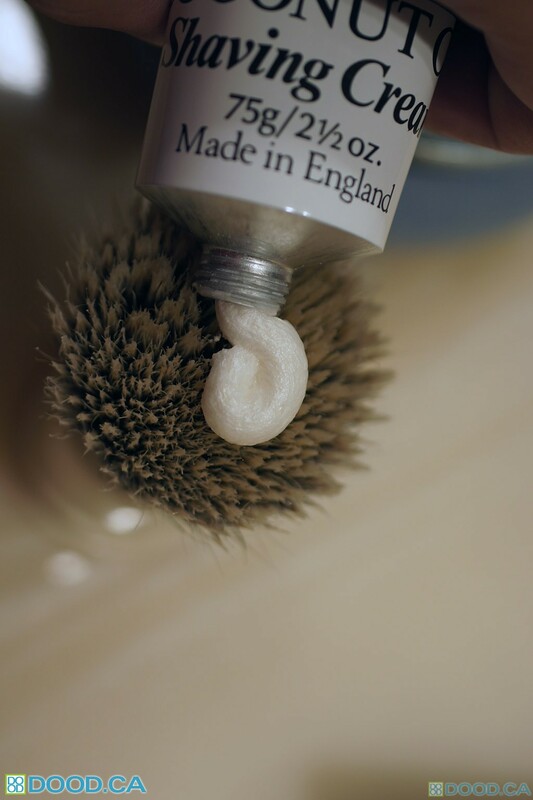 The formula is very moisturizing, and while made in the USA, hearkens to the latherability and performance of the top British creams with its abundance of Coconut Acid and Glycerin. Make no mistake, in all its infamy and Proctor and Gamble ownership, Art of Shaving still makes top-tier shaving products. This stuff is fantastic, and while I do prefer some of their other scents more than the Lemon, it is still very solid and makes some of the most moisturizing and slick lather out there. For those of you that do not like Parabens, AoS Lemon Shaving Cream is Parabens-Free, though contains several other preservatives and generally more than most other brands. However, it is some seriously awesome stuff. As you can see from my gratuitous lather-shot, it is a hell of a performer. In general, the price is solid and the performance is solid – so there really isn’t much else I can ask for! Superb cushion, great lather and superior glide make Art of Shaving one of my favourite performing shaving creams out there. While I generally prefer the marketing and style of the British products, I have to admit that this is a very good product. 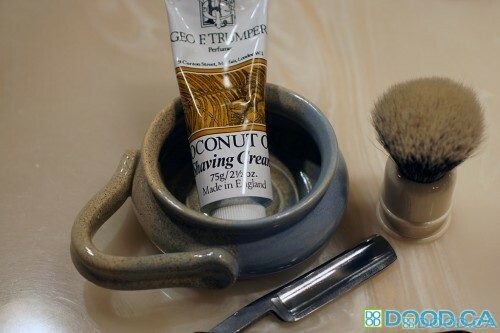 Associated Products Used in This Review: Rudy Vey TGN Finest Brush, Pottersong Shaving Scuttle. Geo F. Trumper, one of the “three T’s” of British shaving fame, is one of the oldest companies around having been established in the late 19th century. This one is their Coconut Oil scent, which is also reported to have the best lathering of all of the all the Trumper varieties. I’ve tried a few of them, but have not noticed a significantly discernible difference that couldn’t be explained by water ratio, brush or bowl differences. Having said that, with different water types I think that could be a difference situation. I rarely have problems lathering any soaps or creams with my water. I generally use a slightly larger than almond sized amount, but that’s because I like a big luxurious lather and product is generally not that expensive. The brush I am using here is a TGN Finest 2-Band Fan mounted in a Rudy Vey chubby style handle. The scent smells strongly of coconut, and if you’re a fan of coconuts, this is definitely for you. I find it pleasant, but I’m not as crazy about coconuts as some people. The product whips into a lather very easily, and is comparable to most quality English shaving creams out there. The cream does have a slickness to it that’s really nice though, and it whips up nice and thick too. It seems slightly less thick in the tube than the tubs of Trumper I have had in the past, though I have never had Coconut in a tub. 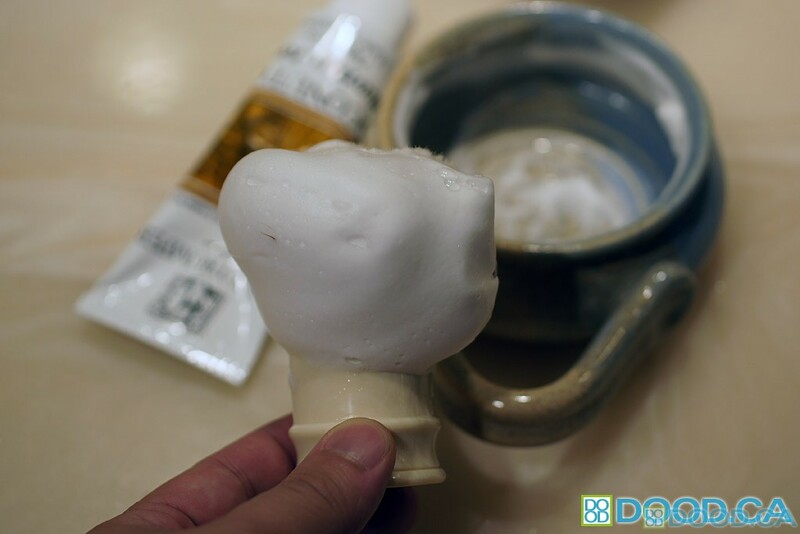 The cream starts off a little bit airy but after a bit more lathering, it thickens up. I know some people prefer a fluffier cream, but I like mine a bit more like yogurt. 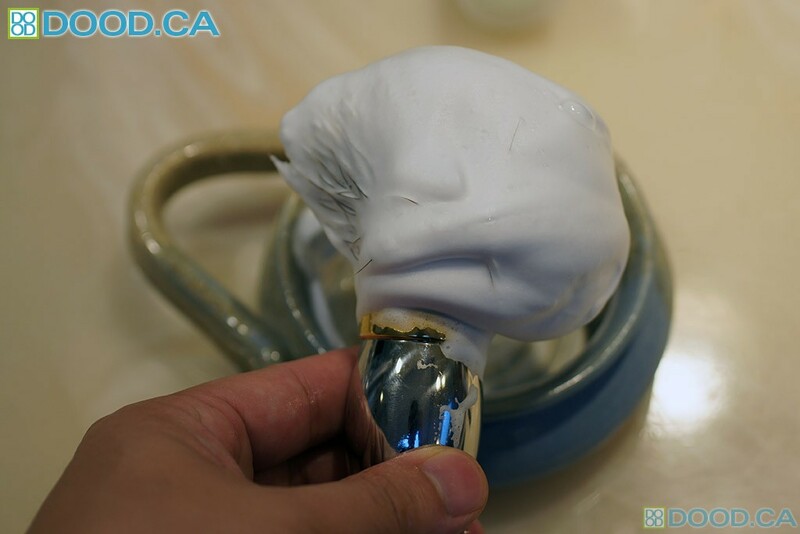 The shaving scuttle with the ridges tends to give me a fluffier lather, but can be tamed down with the right kind of brush manipulations in the bowl. 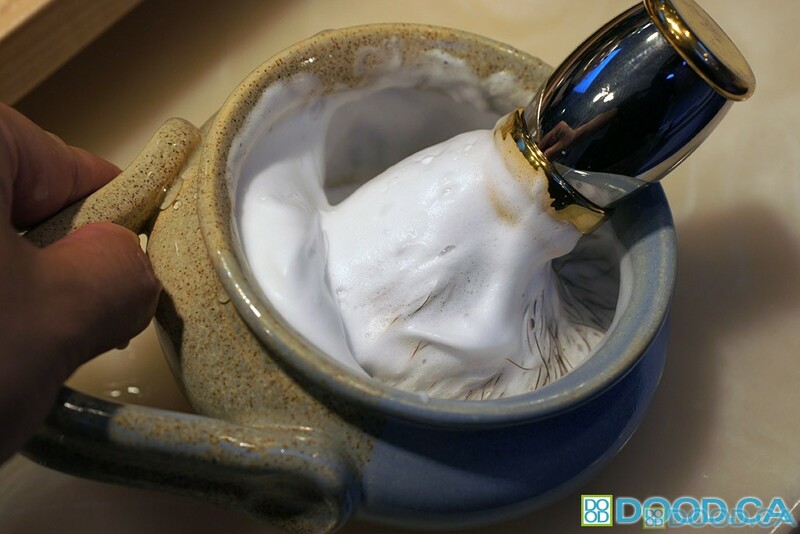 The cream has lots of natural moisturizers in it that leave my face feeling very smooth after my shave. This cream doesn’t dry out my face like some. Overall Geo F. Trumper Coconut is a superb shaving cream that will give you plenty of performance and costs a reasonable amount. It does contain parabens, so some people may shy away from it because of that. 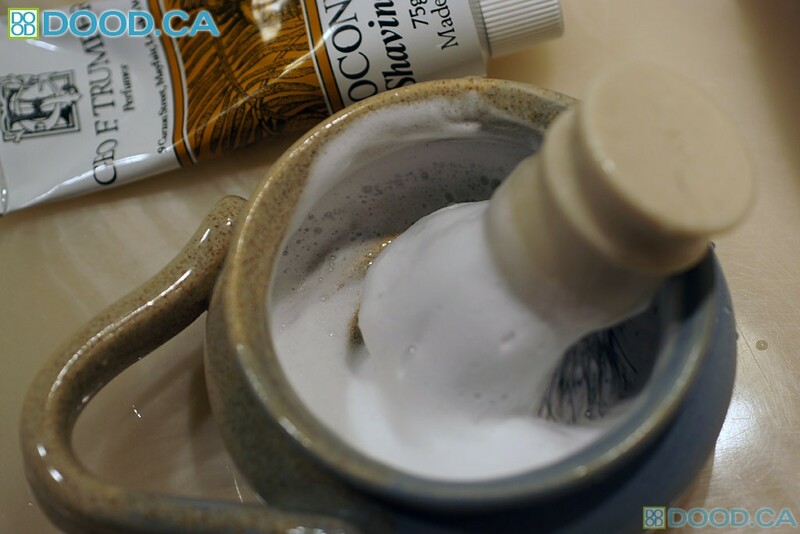 The Glycerin helps moisturize the skin as does the coconut acid, which is the coconut oil as we all know that coconut oil is great for the skin (and everything else it seems these days!). I personally prefer some of the other GFT Fragrances over the coconut oil, but if you’re a fan of coconut you can’t go wrong here. The TGN Golden Nib High Mountain White knot is their flagship knot, featuring a very dense knot filled with some of the softest tips I have ever experienced. The density of the knot still gives it a decent amount of backbone in use too! The knot that I picked up was the slightly larger 20mm knot (it only comes in 19mm and 20mm) but its so packed that it needs a 25mm hole drilled into the handle to fit it. Price at the time of purchase for me was $49.95 for the knot, and it hasn’t changed price in the year or two that they have started carrying the knot for sale. 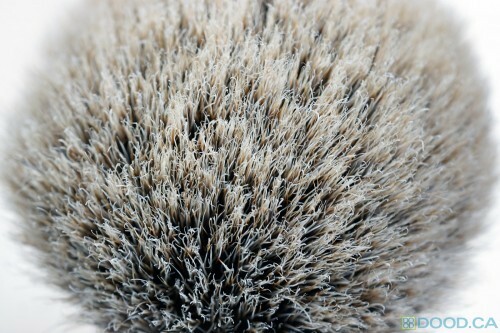 The knot has a 3-Band Silvertip Badger-like appearance, with slightly creamy-colored tips. The knot is a bulb shape, probably leaning towards a more bulbous-shape similar to some Thater brushes, though not quite as pronounced. The hairs are very consistent throughout the brush and show little variation telling me that there is good quality control and allocation of the hairs for this brush. The TGN website describes the knot has having lots of backbone and medium soft bristles. I agree with the backbone statement, but the tips of this knot is incredibly soft. They are also all hooked tips and incredibly soft and plushy when lathered. The brush feels like a giant cloud on the side of my face when I am using it, and might be one of my favourite brushes I own. 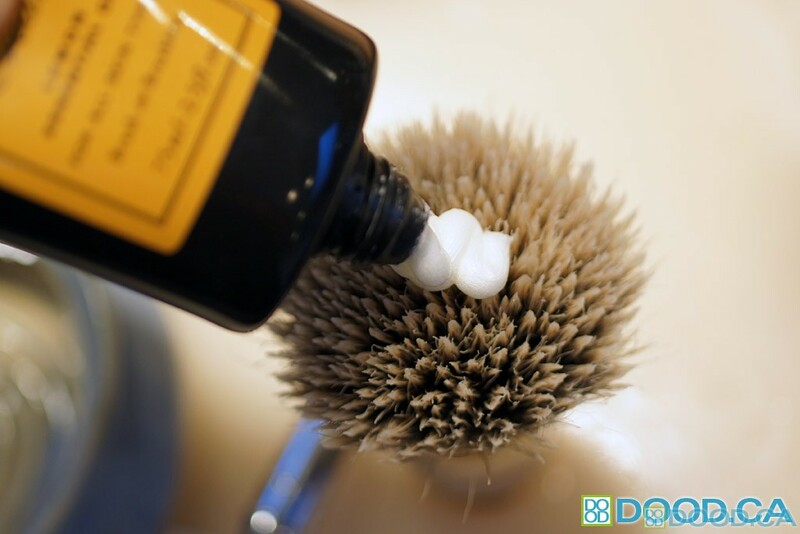 It lathers extremely well, and has very good backbone. This may be dependent on how much loft you have set the brush with. The hairs themselves seem finer, but very densely packed. They don’t appear to be quite as brittle as the Grade A Silvertip, however. You can see under macro photo how many hooked tips these bristles have… I have compared it with the legendary Hooked Tips Rooney brush that a friend owns, and this one has even more hooked tips. It also has a distinctly different face feel than the TGN Finest with the hooked/gel tips. For those of you that aren’t familiar with the hooked tips, they are generally associated with incredibly soft face feel on brushes and while they feel a bit hard when dry, become incredibly soft and gel-like when wet. Before I tried this brush, the TGN Grade A Silvertip was my favourite knot from The Golden Nib. Now, the HMW (High Mountain White) has become my new favourite, especially with the last Grade A Silvertip I received being a bit scratchy compared to the first few that I have bought. My only one reservation about the tips of the High Mountain White is the sheer amount of hooked tips… it almost seems unnatural. Part of me wonders if they were treated to be this way afterwards, not that it matters that much I suppose, since it feels so great. Overall, my favourite knot from TGN, and it is indeed a fantastic knot. It really should be at the price, considering it is as much as or more than many complete brushes out there on the market. I have not owned any Simpson or WSP or other Manchurian or High Mountain White badger knots so I cannot compare with those at this time… just other TGN knots and other standard Best Badger or Silvertip Badger knots from Simpsons and the like, and this knot feels better to me than most of those. Having said that, like most TGN knots, they don’t seem to have the durability that Simpson knots do. The TGN’s do seem to shed if I have not used them in a long time like several months. I have not noticed that with this knot in the 9 months that I have been using it. 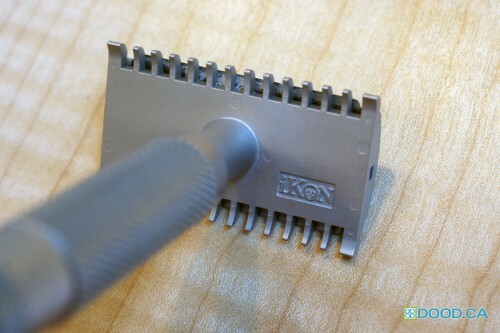 iKon razors have a cult following and are very popular among shaving enthusiasts as they have a reputation for creating a precision made product, at a lower price point than their competition. This probably stems from the Asian construction, allowing Greg Kahn, the owner of iKon razors, to produce at sell at a lower price point than the competition. iKon has been in business for over 5 years now, and has refined their razors constantly throughout the few years that they have been in business. This sand blasted version of the razor head isn’t even available anymore, and is now produced with a Cerakote head, which gives better glide over the skin as well as providing extra corrosion resistance. But we’re not here to talk about the DLC head version, we’re talking about the previous 2013 one. Here is a shot of the underside of the razor, to show where the logo is stamped and also give a good view of the open comb design. Please don’t mind the dried shave cream and stubble in the photo.. I should have cleaned it before taking the photos but I forgot! As you can see, it has a nice sand-blasted finish on the stainless steel head and handle. The handled on this version of the iKon measures 85mm long, with a head which measures about 9mm high totaling 94mm in length, which is just about the perfect length for a razor in my hands. While I enjoy the variety of different lengths of handles just for the spice of life, if I couldn’t only have one length, it would be right around this size. 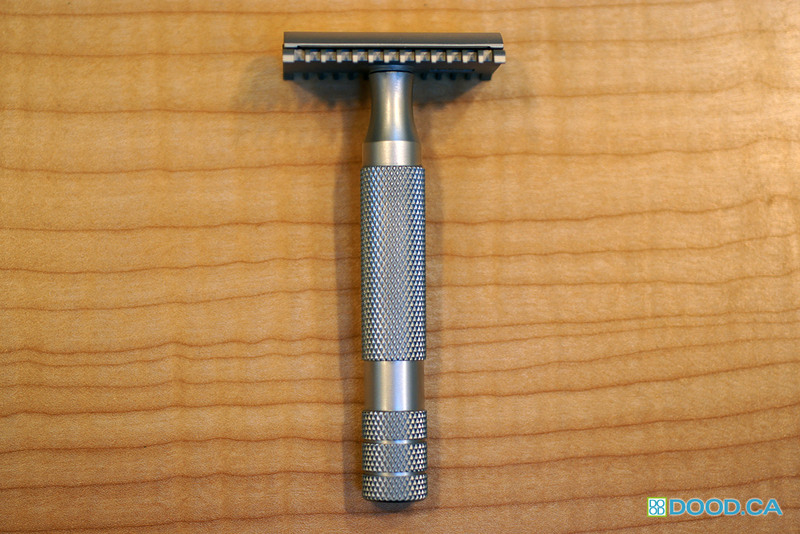 It is almost the exact same length as the Above the Tie Atlas razor. 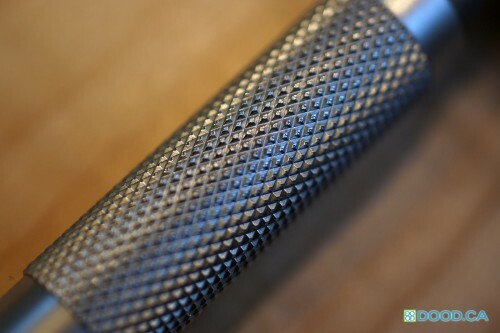 The 316 Stainless steel handle features the popular knurling pattern used on Weber and Feather razors as well, which is probably the best all-round grip that you can get. Is it the coolest looking? Maybe not, because its pretty pedestrian looking, but it works like a hot damn. As you can tell from the close-up, the quality of the knurling is not perfect, but quite a bit better than Weber’s handle. 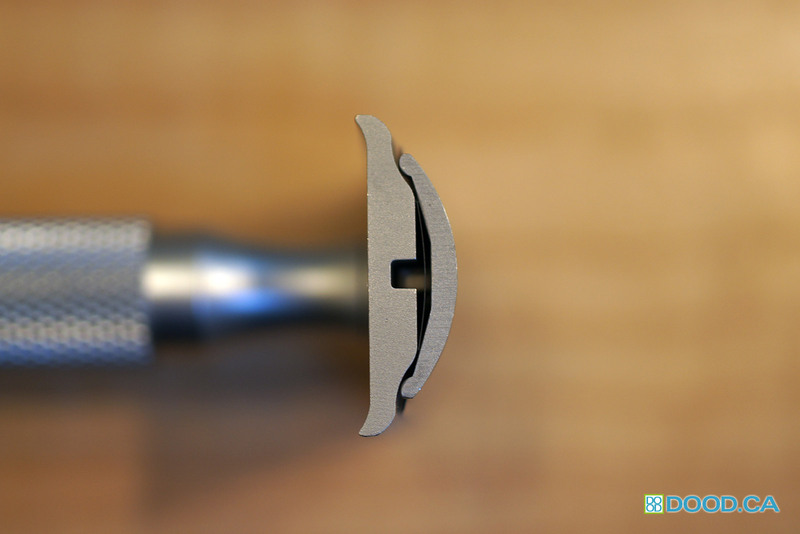 Feather’s handle, which I have not reviewed yet, is the best in terms of fit and finish. I tried to get a shot of the blade gap, but the depth of field was not great and couldn’t get the blade in focus, however it is quiet a narrow blade gap on the open comb model. It is actually a fairly mild razor. It is not as mild as a Feather, but it is a smoother and less aggresive shaver than the ATT R2, another comparable open comb razor. 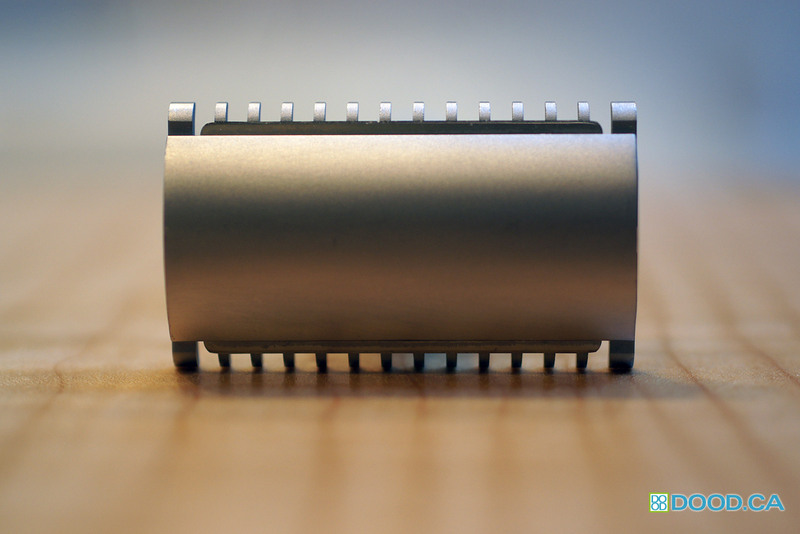 Here’s a shot from the top, showing the open comb design. 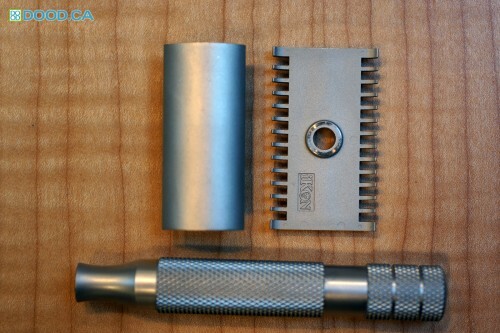 Compared to other open comb razors I have used, the iKon is quite a bit less aggressive. Actually I found it a smoother shaver than even the ATT R1, which is suppose to be a mild open comb razor. 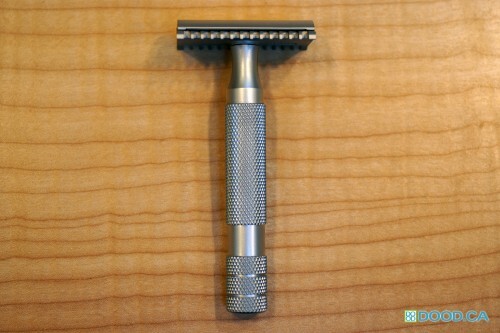 It might be less efficient of a shaver, but I found that it irritates my skin less, but that may be because my technique is more suited to this razor than the ATT. The bead-blasting on the head surface gives the razor better glide than polished or satin-finished head razors that I’ve used. And here is the disassembled shot, and all surfaces as you can see are sand-blasted, with slightly rougher sand-blasting on some parts. Because sand-blasting leaves the surface with micro-texture, it is usually more susceptible to rust and oxidation. This may be an issue for those of you that leave your razor in moist environments. And finally a shot of the inside, that shows the blade centering posts, which in this case are bars. I like the design of the bars, as it has a nice look to it. I find the bars and posts equally effective so for the most part I have very little preference for what holds it as long as it centers and holds well. 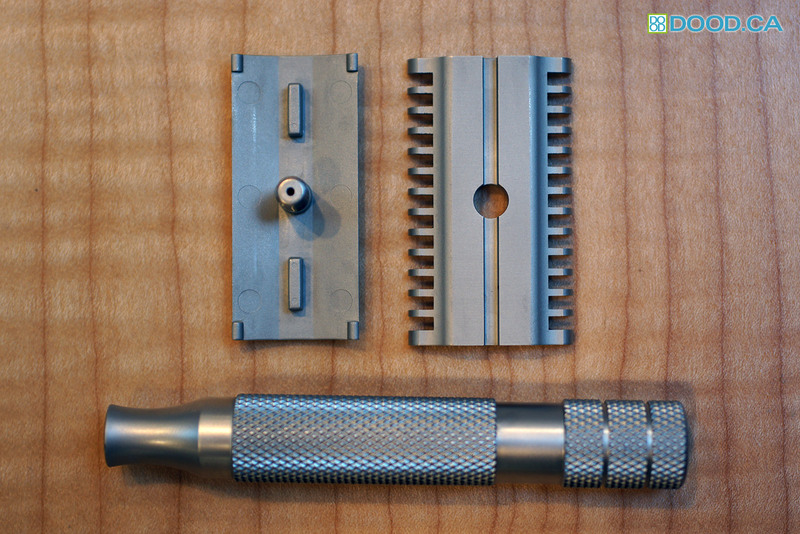 Overall a great razor and incredible value for a solid stainless steel razors at this finish level. 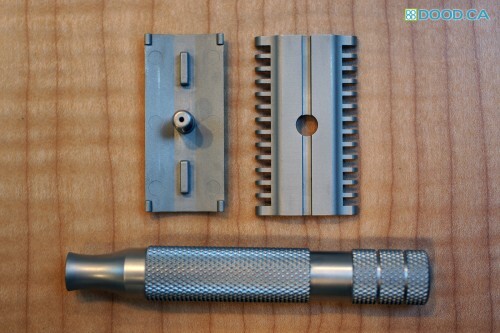 I think iKon represents the best value in high-end stainless steel razors on the market at this point in time. Are they the best? Maybe not, but definitely the best for the money.